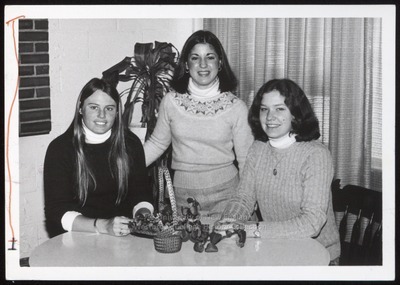 "Three Students at Round Table, Westbrook College, Late 1970s"
Three Westbrook College students gather at a round table in this black and white candid photograph from the late 1970s. Two of the young women sit at the table; the third stands between them at the table. All wear crew neck sweaters with white turtle neck jerseys.